Even if I covered my eyes and wandered around my backyard I would know it was Spring. The warm air on my skin and the unmistakable aroma of native frangipani flowers give it away every time. Spring has arrived here and it's brought with it new life, flowers, tiny new shoots, bright green leaves and the promise of healthy food over the coming months. Lately, Hanno has been working most days in the garden. There is always something to do out there. 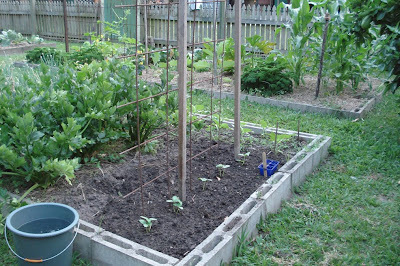 So with the weeding, watering, planting, plucking, tying up, and organising, the garden has sprung into life, trellises are going up, tomatoes are being staked and, already, we are harvesting. Take a walk through the garden with me now. You'll have to imagine the sweet scent of the frangipanis, the call of the whip birds and the warm air on bare arms, but the rest you can see in these photos. 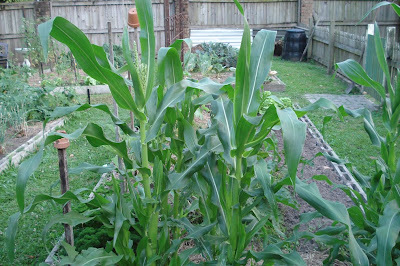 Tassels are forming on half grown corn. There are always too many zucchinis. Why don't we learn! Next Winter's Washington Navel oranges. Grown from seeds in the bush house, these newly planted cucumber seedlings will soon cover that trellis. 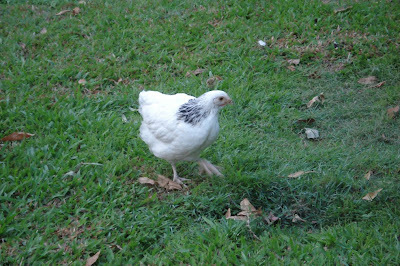 Baby Quentin, the light Sussex chick. 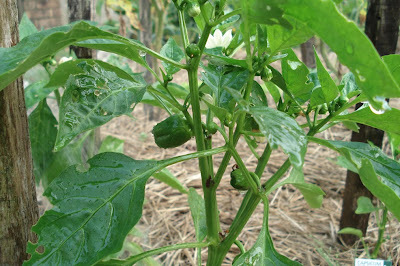 These baby capsicums (sweet peppers) should be ready for harvesting in about three weeks. The follow on flowers and the fruit they turn into will be part of our Christmas lunch. More cucumbers. 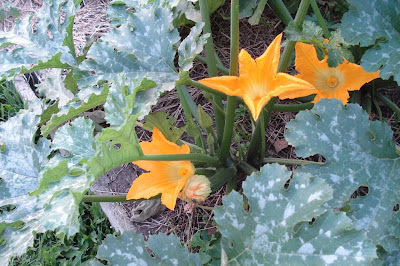 These already climbing their trellis. There are certain vegetables you can't have enough of. Cucumbers are one of those vegetables. Friends and neighbours are always happy to receive a fresh cucumber and any left over are pickled for later in the year. The view from the garden gate. 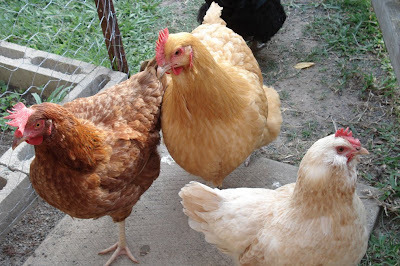 Ann Shirley (a New Hampshire), Martha (a buff Orpington) and Heather (a salmon Faverolles) all waiting for food. 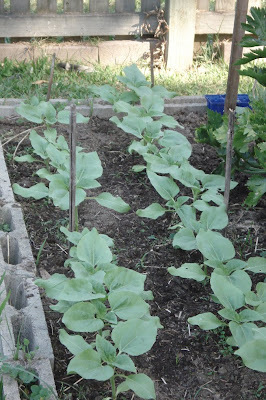 More new plantings to replace the cabbages that are almost all gone. 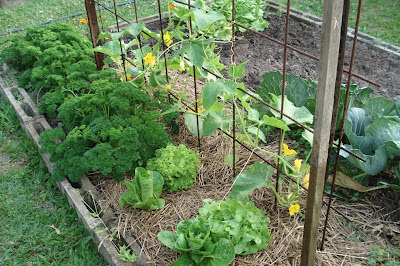 Here we have lettuce, wild rocket (arugula) and boy choi. Sunflowers - these are being grown for the chooks but in reality, the King parrots will eat them well before they ripen enough for the chooks. We don't mind though. The Kings' habitat is slowly being eroded and if we are to keep this glorious bird, we need to help it survive. Eggplants are starting to flower. These are heirlooms - Black Beauty. The potatoes have just sprouted under a thick layer of straw. 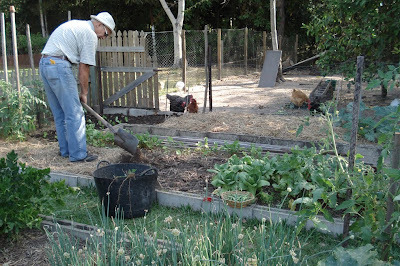 And finally, the gardener - Hanno, hard at work on his pet project - backyard food production. We garden all year now and we've been doing this for a long time, but every year it gets me. 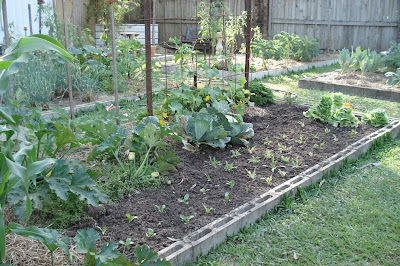 Spring is such a wonderful time to rediscover the joys of gardening and the feeling of quiet satisfaction we get knowing we can produce organic food on the land we live on. I love risotto. It's one of those easy to modify recipes that almost everyone likes - including vegetarians, and I'm sure you could modify this recipe to suit vegans as well. My two favourite risottos are pumpkin and mushroom. There is something about those two vegetables that make this dish something really special. 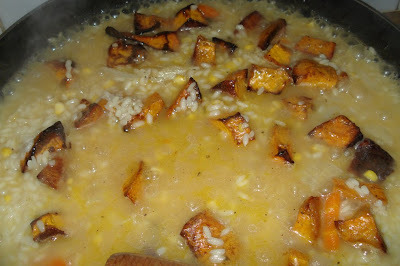 Here is my version of pumpkin risotto, the ingredients are enough for two people. 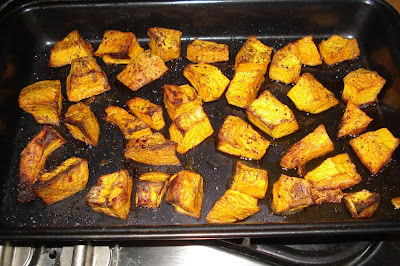 2 cups of uncooked pumpkin - I used a Japanese pumpkin but you could also use butternut squash, Queensland Blue pumpkin, the little Kent or Golden Nugget pumpkins. Choose a rich dark orange pumpkin that can be baked in the oven and hold its shape. 1 cup uncooked Arborio rice - or some other rice suitable for risotto. Ordinary rice will not work in this dish. 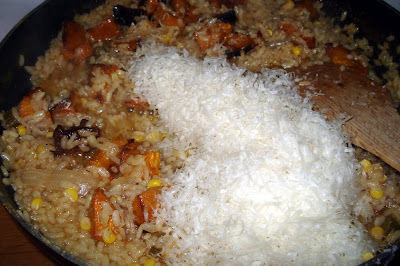 Risotto rice swells up and absorbs the liquid added in this recipe. 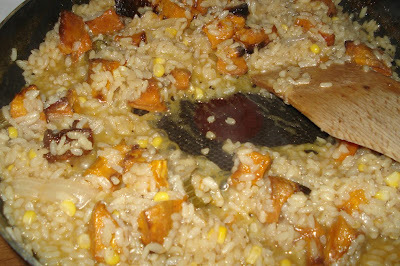 It also releases its starch into the dish and you end up with a very creamy rice. Into a large sauce pan pour two litres/quarts of water. Add whatever vegetables you have on hand - chopped. I used celery, carrot, corn, onion, garlic and parsley. Add the parsley in one piece so you can remove it at the end of the cooking period. Don't add strong flavours like cabbage or parsnips because they'll take over the flavour of the dish. Add salt and pepper to your taste. Remember, adding salt to food, especially to vegetables, brings out their flavour. It's very important to season food as you cook. Put the lid on the pan and bring to the boil, then simmer for about 30 minutes. Strain the vegetables out of the stock before you use it. The stock must be boiling when you add it to the rice. 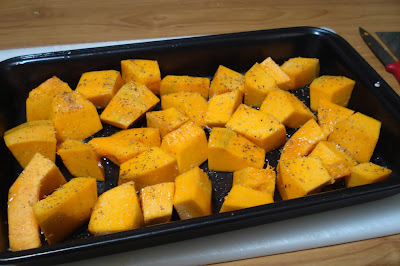 Chop of the pumpkin into bit sized pieces, toss over a little extra virgin olive oil (or whatever oil you use), add salt and pepper to taste and bake in the oven until golden and soft. You can see we are adding salt and pepper again. Each layer of this dish should be seasoned as it cooks. Combining properly seasoned and cooked layers will give you a well rounded final dish that shouldn't need further seasoning at the table. When the pumpkin is cooked, put it to one side until it's needed. You will need your saucepan of boiling stock right next to your frying pan on the stove. You will be scooping the stock into the frying pan so the frying pan needs to be on the heat and so does the stock. You'll need a soap ladle for adding the stock and a wooden spoon to stir the risotto. Add a splash of olive oil to your frying pan and turn on the heat. 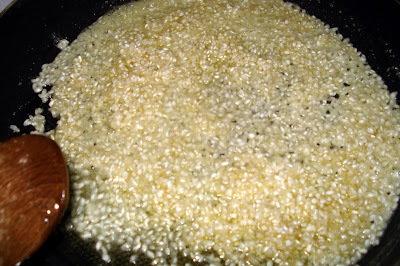 When it's hot, add the rice and stir it around until every grain is coated in oil. Then start adding the stock to the rice. You start by adding two scoops, then stir the rice until the liquid is totally absorbed. 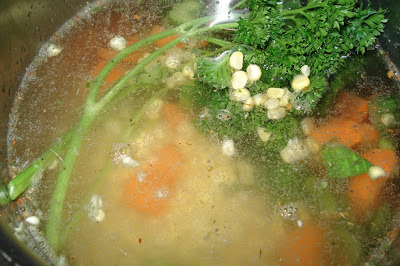 When you add the stock it will look like the photo below. When enough of the stock has been absorbed to go to the next stage, it will look like the photo below. Keep adding the stock one scoop at a time, and keep stirring. Stirring the rice is an important element of this dish. 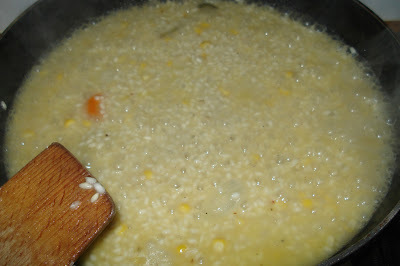 It releases the starch from the rice to make a creamy risotto. When the liquid has absorbed into the rice, add another scoop of stock. Keep doing that until almost all the stock is gone and then add the baked pumpkin pieces. This part of the process will take about 15 - 20 minutes. 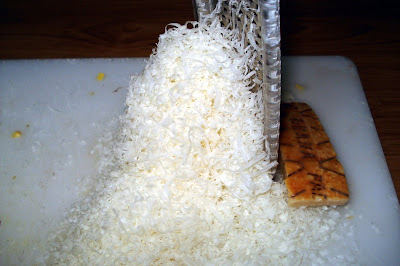 Let the rice simmer on the heat while it absorbs the liquid and while that is happening, grate some Parmesan cheese. Please use a piece of cheese, not that horrible stuff already shredded in the packet. You'll only need a small amount of cheese. This photo looks like a lot but it's only a small piece that's been fluffed up by the Microplane grater. Add the cheese to the rice and stir in. It's almost ready now. 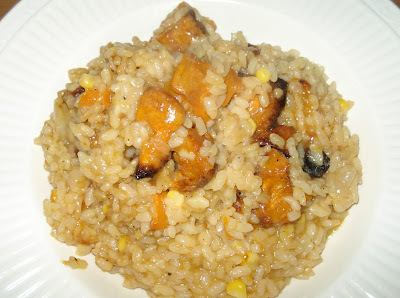 What you're looking for now is creamy rice that is not dry but not too liquid. Keep stirring gently until it reaches a point you're happy with. If you look at the top photo, that it the consistency to aim for. Risotto is genuine home cooking at its best. It's simple, yet complex enough to guarantee you good food for your family or guests. The best risottos are home made. 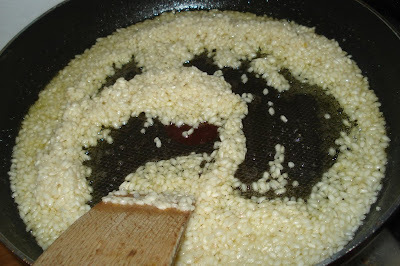 Restaurants often put risotto on the menu but you need mama standing at the stove stirring to make a great risotto, and it needs to be served immediately. Leaving risotto in a warm oven dries it out. Restaurants can't afford the time to keep one chef on one serving for 20 minutes. So if you want good risotto, make it at home. Hanno bought me this lovely bunch of flowers for our wedding anniversary today. We were married in Hamburg, Germany, 30 years ago. 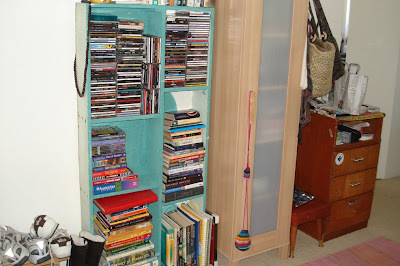 One of the most important subjects I should be concerned about is one I don't write much about but we've had a couple of requests for a posts about daily routines and organisation, so here goes. I guess the reason it doesn't jump into my head like other subjects do is that my days are very similar now, there is an easy rhythm that is often repeated, and, if my truth is told, they don't need much organising. It wasn't always that way though. My days are anchored by a set of daily tasks that are the same every day: feed animals, make breakfast, wash the dishes, make the bed, sweep the floor. Whether I go out, go to work, stay at home and potter around, or stay at home and work at writing all day, those five core tasks are always done. I do other things as well, but those five things are my unchanging constants and they're almost automatic. I don't know about you but I can be a bit wonky some mornings. Doing those five tasks seems to set me up for the day. I do them and while I do, my head and heart settle and when they're finished, I can think about what else has to be done. Another example of this working was when Hanno was still working shift work. He would get up for morning shift at 5.30am, he'd shower and get into his work clothes. While he was doing that, I would wander into the kitchen, make his breakfast, his packed lunch and a cup of tea for me and when he was ready, he'd eat breakfast while I had a cuppa with him, then he'd leave. Those few things would get me ready for the day, and when they were done, I'd know what would follow and the order I would do things in. 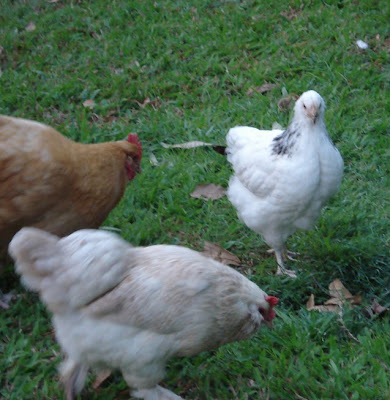 New girl, Quentin, free ranging with aunties Martha and Heather. 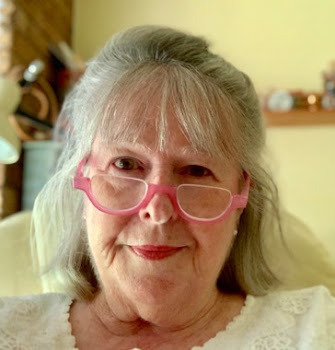 Other tasks that proceed or follow my five daily tasks, and which happen every day, include writing my blog or checking the forum, checking emails, feeding the animals, (all done before the core five) and knitting, cooking and tidying up (always after). Then I have unusual tasks that might happen once a week, once a month or once a year. When I have unusual tasks, I make a list because if I don't, I'll forget one or two of them. 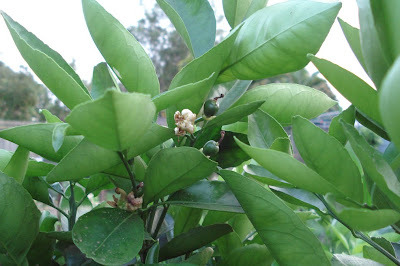 My unusual tasks might include: make ginger beer starter, preserving, make fruit cake, ironing, plant seeds, water garden, make yoghurt, make fresh cheese, sweep verandas, tend worm farm, harvest loofahs or lemons, email photos to work, mend skirt or write article. These are the interesting tasks that I usually enjoy doing. They're different, and they add variety to my day. As you can see, certain things like making meals and cleaning up are never put on a list because they are either done every day or they are part of a normal process - such as we eat dinner every day. The rest of the tasks that I do, but don't do every day, I list each morning after breakfast and after I've done my core five tasks. By then my head is clear and I know what I need to do and what I have the time and energy for. 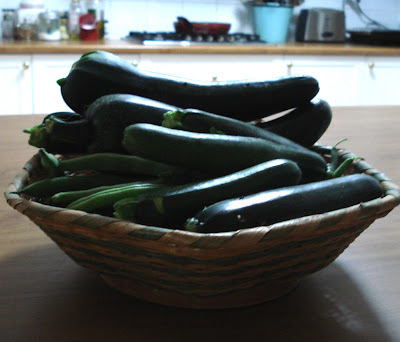 A basket of fresh zucchinis and beans. If you think about it, I'm sure you'll have a set of core tasks that you do as soon as you get up in the morning before you have a chance to think about them. You don't have to organise them, they organise you. You'll probably also have a set of tasks that are done most days - like making dinner and packing lunches, that you don't have to be reminded of. But aside from those two set of tasks, there will be the things that need doing today, but not every day - they go on a list. BUt if you're new to lists, then maybe it's wise to list all your taks, including your core tasks, in the order they'll be done, until you get used to working in this way. If you can do your list the night before, that's great, if not, do it while you have your breakfast. The important tasks should always be first so they get done. And remember, things on the list that don't get done can be transferred over to the following day but make sure you prioritise your list so the important things at at the top and are done first. I'm very interested in how you organise yourself each day, if you have a moment, please share your routine with us, it may help someone who is in a similar situation to you. Hanno and I will be busy bees this morning. I was out watering the vegetables before the sun came up; it's going to be very warm here again today with the possibility of another dust storm. 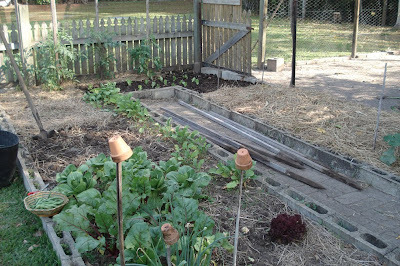 I did some work in the bush house too, planting more seeds for follow up crops. I asked Hanno to cut our bay tree back to the stump because it's covered with scale and it's too much of a hassle to spray the darn thing. 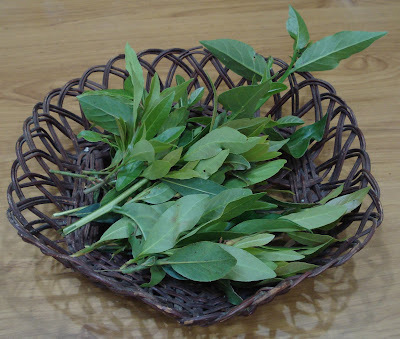 I harvested enough leaves to do us for a couple of months, when I expect the tree to be in full production again. 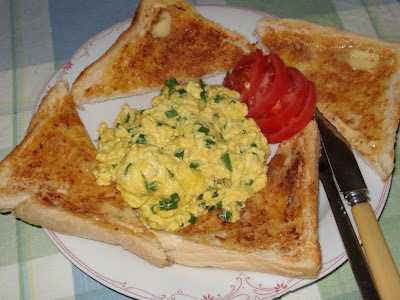 I came inside to make breakfast around 7.30, called Hanno inside when it was ready - scrambled backyard eggs with herbs, tomato and toast, and black tea, and now we're both working on our different tasks for the morning. I want to sit and knit all afternoon so I need to get through a few things so that can happen. Otherwise we'll just be pottering around today and tomorrow - working, enjoying the weather, watching the goings on in the yard and taking in all we are offered. Just a gentle reminder to get busy with your handmade Christmas gifts. I'm very slow with mine but I'm doing the best I can with the amount of time I have this year. If you'd like some real inspiration, look here. It's a real treat of a blog. I adore her crafted items and her home is just lovely. There is a very good clasp purse tutorial here. 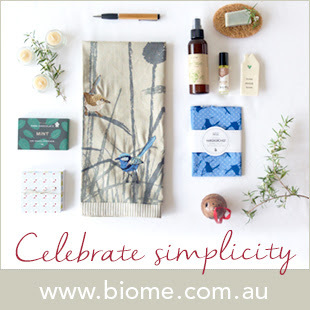 They would make great gifts for Christmas or birthdays. 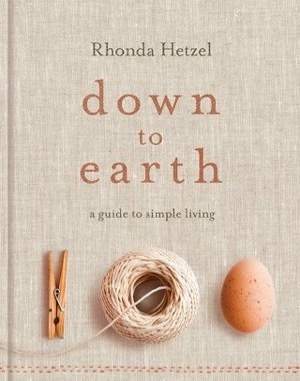 If you're new to embroidery or stitching, here is a very good site for you. It clearly shows how to stitch various stitches. Maybe you could stat with a sampler. 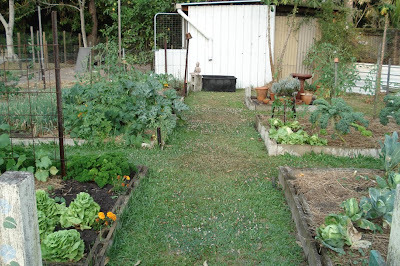 And finally, this is just a delightful blog full of bees, food, chooks and gardening. Enjoy your reading and have a happy weekend. It is such a good idea to take time out every so often and do something out of the ordinary. Yesterday, Hanno and I set off for a day in Brisbane. It was an easy prep for the trip - just a bottle of water for us both and the lemon pie, because we knew we had a delicious lunch being cooked for us. We arrived just before lunch so we had a chance to sit and talk for a while and enjoy a cold drink. Sarndra and Shane were both happy for me to take photos to show on the blog but I didn't think to take them until we had dessert - the best quiche had already been eaten. Lunch consisted of the best quiche I've ever eaten and a garden salad. Of course you would expect a fine quiche from a fine dining chef but this one was made by Sarndra, with a little help from Shane who made the pastry. The quiche was feta cheese, olives and sun dried tomatoes on Maggie Beer's sour cream pastry. I've asked Sarndra to email the recipe to me and when she does I'll pass it on to you. It's a masterpiece. And I have to tell you that having a daughter-in-law who says she isn't a good cook, but produces such a delicious dish is a great joy to me. Our Sarndra is a very capable woman. 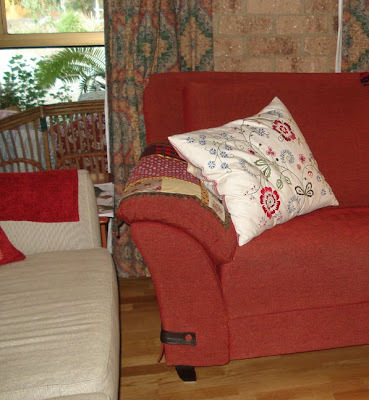 Their home is furnished with new, second hand and found furniture and it all goes together to make a warm, comfortable and inviting home. I don't write a lot about raising babies and young children. It's such a long time ago for me now, although I do remember a lot of it - the struggles and anxiety, and being up all through the night when they were sick or scared. I also remember the many moments of pure joy when I watched either of my sons do something they thought they couldn't do or when they brought home a prize from school, or a new friend. I recall reading to them, playing on the floor with Legos, all of us going to the movies, birthday parties, camping trips and holidays in Sydney with my parents. Through all those times I hoped they would grow into good and decent men who remembered the values they were brought up with and who would make a life that made them happy and proud. And they have! I have never seen Shane happier than he is right now. Sarndra is the ideal girl for him and when I see them together, even though they're just starting out in their marriage, with all the struggles and adjustments that come with that, it seems to me they are the real deal - a fixed unit, together forever. Marriage is tough, there is no doubt about that, and I know that my marriage has had all the highs and lows that most marriages go through. As I look back on my marriage, I think what got us through all those lows was that there were a lot of highs and there was a strong foundation of love, acceptance and respect. We talked through our problems and had more than one fight (never in front of the kids) but through all those bad times we always had trust in each other. That never died. Never ever. I think when the trust goes, so does the marriage. 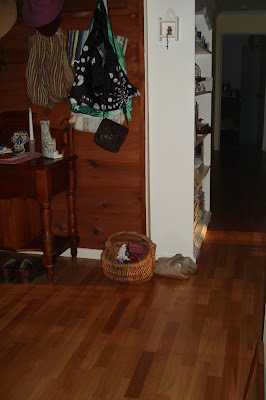 This area is just near the front door. As we were leaving, we wished Sarndra happy birthday for next Tuesday and mentioned that on Monday it's our 30th wedding anniversary. Sarndra said she hoped she and Shane will be as happy as Hanno and I are on their 30th anniversary. Seeing them as they are now, I think they have a very good chance of that happening. Thanks for a great lunch Shane and Sarndra! Hanno and I are having a day off today. We're going into Brisbane to have a combined birthday lunch for Hanno and Sarndra. Hanno's birthday was last week, Sarndra's birthday is next week so it's a good chance for us to catch up and to celebrate two important events. 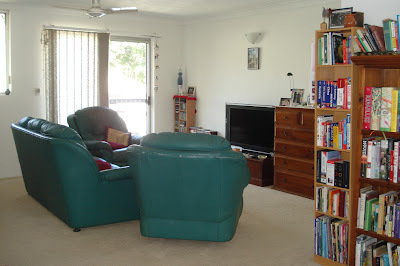 Someone asked the other day for a photo of Shane and Sarndra's flat. I'm taking my camera and I'll ask them but they have to be totally comfortable with it. 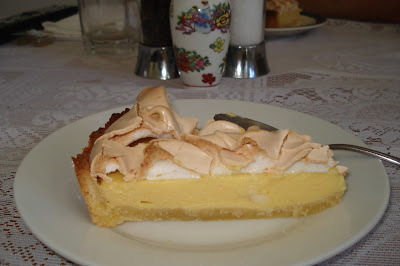 I've just put a lemon meringue pie in the oven to bake. I made it from scratch this morning starting at 5am. Alice sleeps in the kitchen and she must have thought she was dreaming because she just lay there watching me. Shane said he'd make lunch and I said I'd bring dessert. 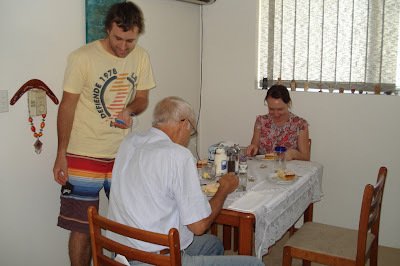 It's always good to share - the food, the tasks, the conversation and the washing up. Usually at 3pm the sky is bright blue and the sun is shining. 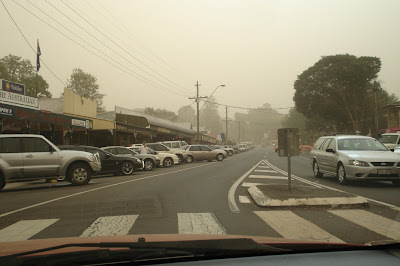 This is yesterday in the main street of Maleny. If you heard about the dust storm over Australia yesterday, it started off in and around Sydney early in the morning with bright red skies. I've never seen anything like it. By early afternoon, I looked out the window at work to see clouds of dust and what looked like a winter's haze. 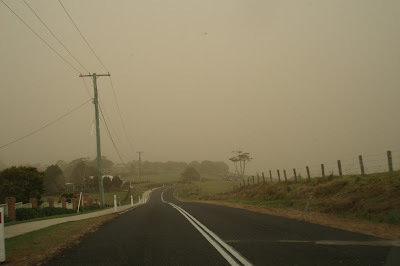 Our dust was a yellow colour and it covered everything, including my car in the car park - Hanno had just washed it. The drive home from work. Usually on the right hand side you can see blue sky and the pacific ocean. Before driving home yesterday I visited the building site for our Centre. The frame is up, and I've been told we'll be moving in around 1 December. I'm so excited! The Centre has been operating for 16 years and we've been in all sorts of poky little places. Finally, the government has recognised the work we do and soon we will have this wonderful new building. I can hardly wait. The frame is up! Our new Centre. Thank you all for your votes. I really appreciate them and your support. I doubt I'll get anywhere near winning because all the other nominees are very big Asian blogs but being nominated is a prize for me. If you can't register your vote here on the side bar, go here to their site. Remember, you have to vote in every section before you submit your vote. And now I'm off to check the pie and get ready to go out. I hope you all have a beautiful day. I was really surprised to be nominated for the Most Influential Blog in the first Asia Pacific Blog Awards. I am now one of five finalists for this award. Yikes! I can't believe it. Now it's over to you. I've put the voting button on the right side of the blog so if you feel you'd like to vote for me, please do. You have to place a vote in every category, not just the one I'm in. And, you can vote more than once, but only once every two hours. Thanks everyone. I appreciate your help with this. You all know by now I love my stockpile. 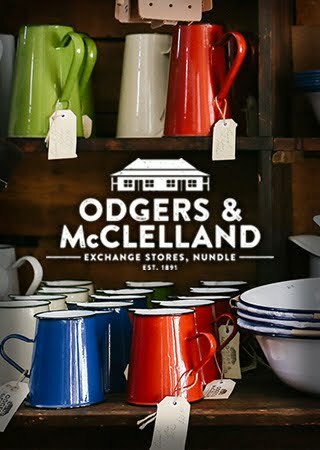 It has helped us save a lot of money over the years but it's also helped me organise myself and it's stopped us wasting time at the supermarket every week. Now we shop monthly, but we could easily go a lot longer than that without shopping. Most of my stockpile is kept in a cupboard right next to my kitchen. It's convenient and easy to check and clean. My pantry is in the kitchen. 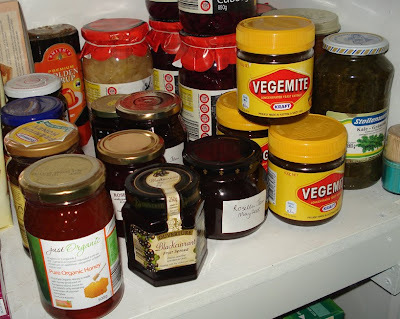 When anything is taken from the stockpile and opened, it is either eaten straight away or what remains in the packet, jar or tin is poured into a glass jar and stored in the pantry or the fridge. But I also store packs of rice, lentils, nuts, grains, cereal, flour etc in our chest freezer - that sits in our second bathroom. Again, when we open a pack, it is transferred to the pantry and sits in a glass jar. Most of the jars I use are canning/preserving jars but I also have a number of jars my chef sons have saved for me from their work places. These used to be large catering packs of pickles/gherkins/olives etc and they hold around two litres/quarts. They're very handy for storing rice, self raising flour or dry pasta noodles, which we use in Alice's food. I also recycle old jam and honey jars and although I used them mostly for the jams I put up, they're also handy for small amounts of beans or lentils. 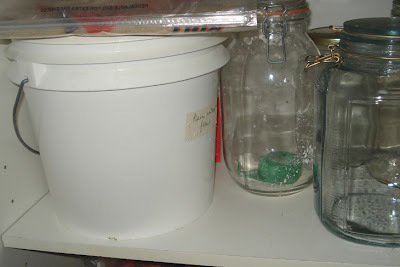 Every pantry needs a few large containers that will safely hold about 5 kilos (12lb) I have a few icing buckets I got from my local baker and a couple of Decor bins that are currently holding groats and plain white flour. My icing buckets hold a couple of types of bread flours, it's mixed grain and rye at the moment. 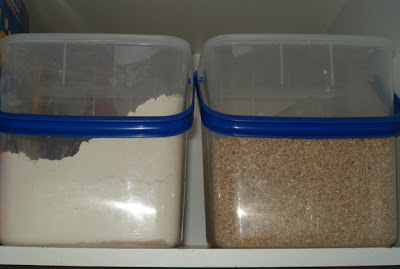 If you go searching for recycled bins and containers make sure you only use food grade containers. A good rule of thumb is that if a manufacturer originally used it to hold food, it's probably food grade. Most old food containers are safe to use, make sure the lids fit properly and if it has a metal lid, it's not rusty and has no small holes. If you're in the process of establishing a stockpile it's a good idea to see it as an investment - both of time and money. Like any investment you need to look after it. ALWAYS be on the lookout for pantry moths. They're a small brown moth that can be brought into your home in newly purchased bags of grain, flour or rice. Putting dried good in the freezer for a few days when you first bring them home will kill any lurking eggs or larvae waiting to hatch out. But still be on the lookout for them because they can fly into your home and lay eggs in your uncovered and poorly stored goods. Make sure everything you open is stored in a container that can be properly sealed. You don't have to have everything matching, I quite like the madness of my pantry with jars of all different shapes and sizes. We have a wonderful topic over at the forum where you can see photos of stockpiles and add photos of your own if you wish. 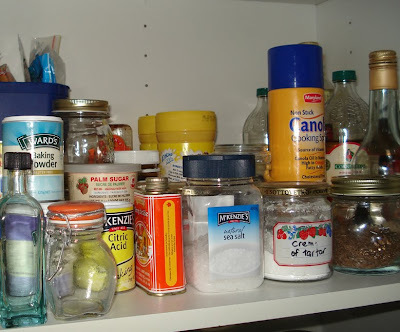 Your stockpile cupboard and pantry should be emptied and cleaned out at least every six months. 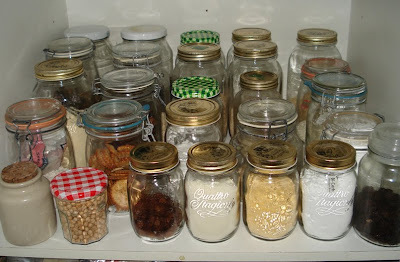 When you remove the items, check the contents of jars and make sure everything is in order. 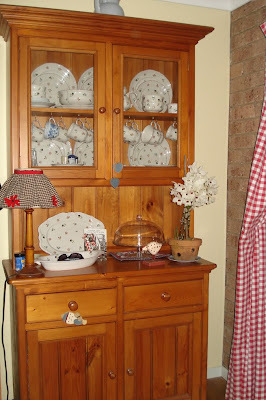 Wipe over the shelves and inside walls of the cupboard, wipe dry and replace everything. Some ladies use bay leaves and other herbs to keep bugs at bay but I've always found that if I store my larger packs of dried goods in the freezer or freeze them for a few days they're fine. If you haven't thought about stockpiling yet, I encourage you to do so. It works well at our home - for just the two of us - and it would be an even greater money and time saver for a larger family. 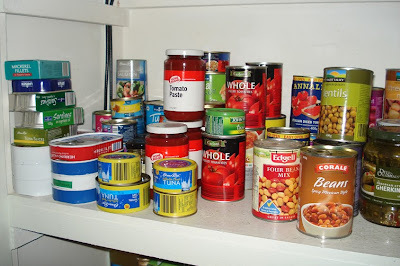 I've written more about stockpiling here, here and here. Thank you so much for the thought and consideration you put into yesterday's post. The young lady in question emailed overnight to say she was quite overwhelmed with the response. She doesn't live in Australia or the US and asked that I not say where she is from. She said both she and her husband read every comment and they had a good talk about their situation. Things aren't looking so grim for them now and they feel they have a direction to head in, whereas before they were quite confused. So thank you for your thoughts, you helped a couple who needed to read them. Carrying on from yesterday's post I thought it would be a good opportunity to explore the feelings connected with being at home and knowing that you make your own home what it becomes - be that good or not so good. I've written before that housekeeping and homemaking were very low on my list of priorities when I first came home for good. I say 'came home' because up until that point, my home wasn't what it is now - it was just a place to sleep and invite people around to if we didn't go out. Pathetic. I'm wiser now, my home has taught me many things, including that if I didn't take the time to be at home, if I didn't fluff my nest and make it the warm and secure place I wanted it to be, no one else would and I would continue to search shopping malls for junk to make me feel better. That split second when you suddenly realise that home is not the enemy and that looking after it is an act of love for all your family and a gift to yourself, is a powerful moment of absolute clarity and insight. You're aware that you make your home what it will be, no one else will do that but you, and whatever work you put into your home will be a reflection of you. It is an opportunity and a challenge. It will show what is important in your life, it will highlight those things you treasure, and, in turn, will reflect your tastes and interests to all who visit you. 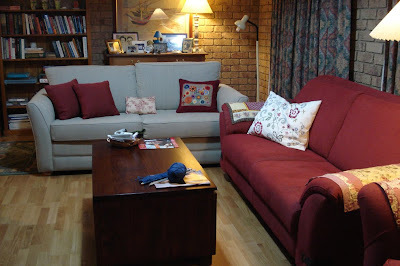 When you realise that your home is your work in progress you are given the opportunity to make it the comfortable and protected place that all families need to relax, renew their energy, and grow closer to each other. The real challenge here is when you don't have a lot of money to spend but want a cosy, interesting and welcoming home. Most young couples fall into this area and the trick is not to fall for all the advertising hype and rush to charge up your credit card with the latest fashionable furniture. 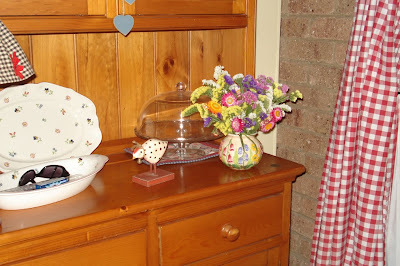 Smart couples search op shops, thrift stores and road side throw outs for bits and pieces that will suit their purpose. They build their homes on older furniture that is either free or very inexpensive and then modify it to suit themselves. The end result is a home unlike a million others who fell for the advertising. They have the satisfaction of working together to find what they need, and no credit card debt. My own son and his new wife are doing this right now. They have our old lounge suite and picked up a dining suite from a road side throw out. 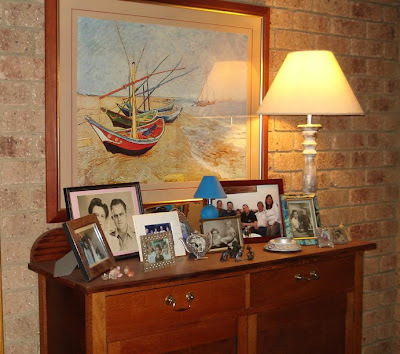 Their home is a delight to visit, it's comfortable, inviting and interesting. We are going there for lunch on Thursday and I'm looking forward to it very much. Working together through hard times is one of those things that draws couples together, it bonds them like nothing else. But the furniture and bits and pieces you put in a home are not the full story. 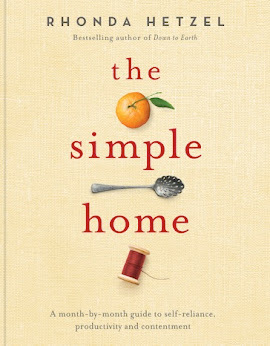 This story is completed by the work done by the homemaker and the feeling of contentment that comes from it. And whether you're a homemaker who does most of the work in the family home or if you're the delegator of chores and director of operations, the result is the same. A functional and secure home will nurture all who live there. When I worked for a living and shopping was part of my recreation I used to be bored if I stayed at home. I wondered what on earth homemakers did all day. Now I know. I was lucky enough to wake up to myself, ditch the shopping and return to my home wholeheartedly. And anyone can do that - those who work outside the home and those who work in it. Accepting the power you have to make your home what is can be, to provide nutritious food, to shop according to your budget, to keep a clean home, to teach young children that everyone contributes to the welfare of the family by doing chores and helping, to look after what you own, to mend, recycle and reuse what you can, to live in an environmentally sound way and to express the love you feel for your family within the confines of a safe and peaceful home is the true gift of a homemaker. You make your home what it becomes - it is your work in progress. Hanno asked me to thank you all for the lovely birthday wishes sent his way on the weekend. He is 69 now, the last year of his boyhood. Next year he'll have to start acting more sensibly. ; - 0 We drove down to the beach to have lunch with our friend Diane and god-daughter Casey. For those of you who remember Casey's accident (she was in a bus hit by a drunk driver two years ago), she is still in a wheelchair and has not been able to work since. But it's always good to see them, they are two of our most favourite people, and we talked and laughed for hours over lunch and drinks. Hanno is a member of this club and they had sent him a letter wishing him a happy birthday, offering a complimentary lunch and drink; of course we took up the offer. It was definitely a good way to spend a weekend birthday. The Christmas knitting has been stepped up a notch. 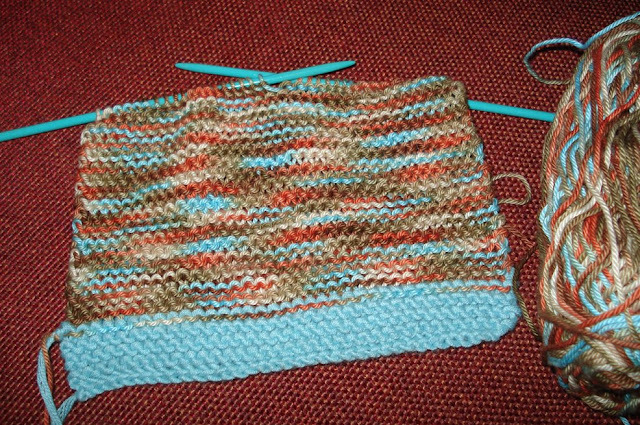 This is a pure cotton and bamboo (the aqua bit) dishcloth. I received an email last week from a young lady here who is very upset about the prospect of losing her job. She wanted to know what I thought her best course of action would be and asked me to help her and her husband through this difficult time. I sent her a reply telling her my thoughts but said I would also post about it today and see if all of us could workshop this problem for her. Together we should cover all angles. This girl is 29 years old, married for two years, pregnant and due to have their first baby in February next year. The pregnancy was planned, what they didn't plan on was that she would lose her job before she had a chance to resign. Her job finishes mid-October and she will get a payout of about $4000. Her husband has a good job that is stable, which is good news, but they have nothing for the baby yet and they don't have a stockpile. I suggested that from now on, even though she is still being paid, they live on his wage. They might as well get used to it now and be ready when they only have one stream of money coming in. Her wage should go in the bank until they work out a plan of action. I think the priority is to sit down and make up a new budget - a realistic one that covers two adults and a baby. They only have five months until the baby arrives and during that time they'll be equipping the nursery, buying and making clothes, blankets etc. When they sit down to do the budget, they'll have to work out what they can get rid of. They have two cars, three phones - one landline and two mobiles, pay TV, no stockpile, no emergency fund, no health insurance and nothing ready for the baby. 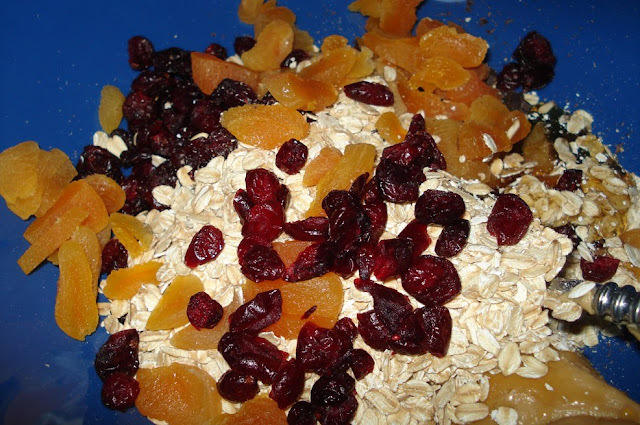 The beginnings of some muesli bars made on the weekend. It sounds pretty grim but the husband gets a good wage that I feel should be enough to get them by and pay the mortgage as long as they sacrifice a few things and live frugally. She said they are committed to living a green and simple life but have just made that decision; she found us and this blog two weeks ago. If they are that way inclined anyway, I think they should be okay with this. My suggestion to her was to get rid of everything that isn't necessary to their present circumstances. They bought the second car for her to get to work. They'll be able to sell that when she finishes work, they think it's worth about $7000. I think that money should be put away for their emergency fund. They should get rid of one or two mobile phones. I know young people are really connected their phones, but are they really necessary? When their contracts are up, at least the most expensive one should go, I would like to see both go. Pay TV - out! There is enough drivel on regular TV to waste time on, no need to pay for more. I know this sounds harsh but they need to conserve money at this important period of their lives. In a few years, when things stabilise and they're more settled, they can get it back if they want to. I would suggest the $4000 she gets as her payout should go to pay extra off the mortgage and everything they sell should go towards extra payments too. Getting rid of the mobile phones, TV and extra car will save a lot of money, probably the equivalent of her wage. So hopefully, if they budget well, and live frugally, they should get by quite well on what he earns. When her paid job finishes, she should consider her job to be manager of the household funds, being able to feed the family healthy food on a weekly budget, searching the op shops and thrift stores for baby clothes, rugs, a pram and cot and paying all the bills on time. She will become a homemaker, with everything that implies. It will be her job to work to her budget, fluff up her nest and make a wonderful home, and I hope she finds satisfaction and contentment doing it. A first baby is such a special time for a family, this should not take away from such a special event. I see it as a challenge. She can use the time between mid-October and February to organise the home, to learn how to sew and knit, to start using green cleaners, to build a stockpile. Maybe she could also make cloth nappies/diapers. 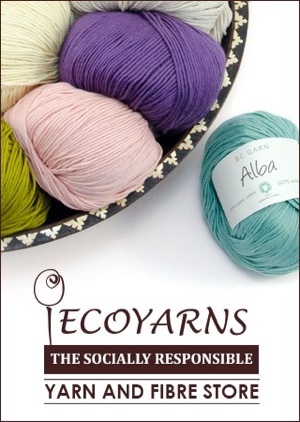 Does anyone have a good site with patterns and instructions? 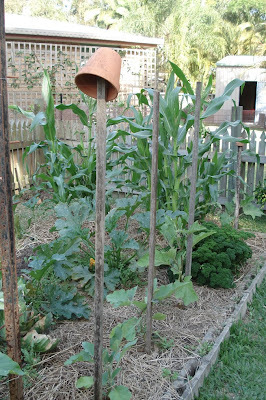 I wouldn't start a vegetable garden, not yet. But that could happen in the years to come. But now there are plenty of things to occupy her each day - learning how to cook from scratch, working out how to shop in a different way to get the best value for her money and getting ready for the arrival of her baby. What started out as a catastrophe could be the catalyst for this young family to change how they live. 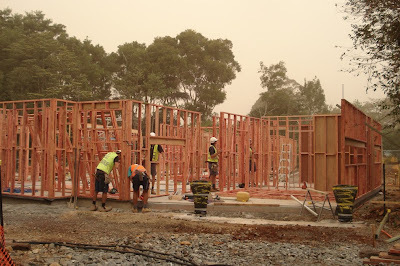 They can build a good life, but it will be a frugal and simple one, one that is more environmentally sound and dare I say it, one that is more enriching. This will be an equal partnership in every sense of the word - one partner working for a wage, the other managing that money and the home for the benefit of all, while they build their family and future together. Sure, it would be a shock to hear you'll lose your job but once over that, with a few safeguards and budget strategies in place, I think this family will cope well. What do you think? What advice can you give this young couple?